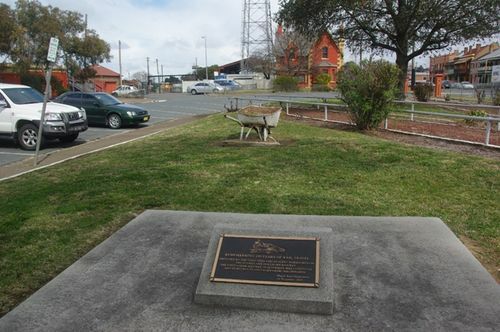 Plaque in remembrance of 150 years of rail travel between Sydney and Goulburn. It was at Goulburn in 1846 where meetings were held that saw the formation of what became the Sydney Railway Company, with local business people such as William Bradley, who owned the local brewery, and William Hovell of explorer fame, being two of the movers, with hopes and plans for a railway connection to Sydney. The railway, by then under government ownership, eventually reached Goulburn in 1869. AND NURTURED IN GOULBURN FROM 1846 ONWARDS.